More Frac'ing Lies from the EPA, Part Deux | Watts Up With That? This is the promised sequel to More Frac’ing Lies from the EPA. Most of this report deals with everything other than frac’ing. “There are instances when hyrdofracking has impacted drinking water resources. That’s an important conclusion, an important consideration for moving forward,” said Thomas Burke, a deputy assistant administrator and science adviser at the EPA, on a call with reporters Tuesday. What evidence does the EPA present to support this pack of lies? “Production wells are sited and designed primarily to optimize production of oil or gas, which requires isolating water-bearing formations from hydrocarbon-bearing formations in order to prevent the water from diluting the hydrocarbons to protect drinking water resources”… No schist, Sherlock. Yes… Problems *could* cause all manner of bad things. What follows is about 65 pages of dissertations on well casing, cement jobs, how fluids can migrate through the subsurface, microseismicity, examples of frac’ed wells being in pressure communication with one another and a lot of blather about how these things *could* affect groundwater. It’s not until section 6.4 that we get anything truly relevant. In the injection stage of the hydraulic fracturing water cycle, operators inject hydraulic fracturing fluids into a well under pressure that is high enough to fracture the production zone. These fluids flow through the well and then out into the surrounding formation, where they create fractures in the rock, allowing hydrocarbons to flow through the fractures, to the well, and then up the production string. The production well and the surrounding geologic features function as a system that is often designed with multiple elements that can isolate hydrocarbon-bearing zones and water-bearing zones, including groundwater resources, from each other. This physical isolation optimizes oil and gas production and can protect drinking water resources via isolation within the well (by the casing and cement) and/or through the presence of multiple layers of subsurface rock between the target formations where hydraulic fracturing occurs and drinking water aquifers. 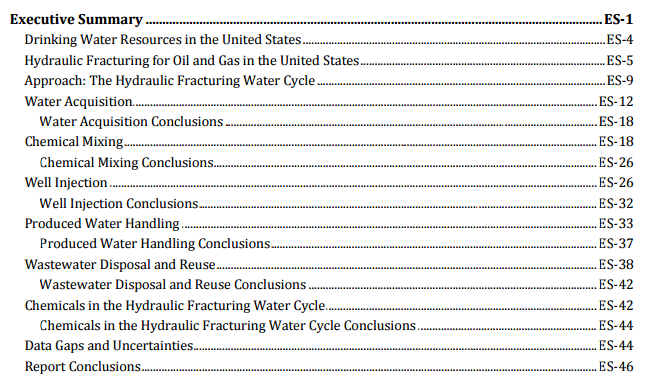 In this chapter, we consider impacts to drinking water resources to occur if hydraulic fracturing fluids or other subsurface fluids affected by hydraulic fracturing enter and adversely impact the quality of groundwater resources. Potential pathways for fluid movement to drinking water resources may be linked to one or more components of the well and/or features of the subsurface geologic system. If present, these potential pathways can, in combination with the high pressures under which fluids are injected and pressure changes within the subsurface due to hydraulic fracturing, result in the subsurface movement of fluids to drinking water resources. The potential for these pathways to exist or form has been investigated through modeling studies that simulate subsurface responses to hydraulic fracturing, and demonstrated via case studies and other monitoring efforts. Finally! On page 70 of Chapter 6,page 346 of 666 pages… “demonstrated via case studies and other monitoring efforts”… Observations!!! We identified some example cases in the literature where the pathways associated with hydraulic fracturing resulted in an impact on the quality of drinking water resources. One of these cases took place in Bainbridge Township, Ohio, in 2007. Failure to cement over-pressured formations through which a production well passed—and proceeding with the hydraulic fracturing operation without adequate cement and an extended period during which the well was shut in—led to a buildup of natural gas within the well annulus and high pressures within the well. This ultimately resulted in movement of gas from the production zone into local drinking water aquifers (Section 6.2.2.2). Twenty-six domestic drinking water wells were taken off-line and the houses were connected to a public water system after the incident due to elevated methane levels. “Failure to cement over-pressured formations through which a production well passed… resulted in movement of gas from the production zone into local drinking water aquifers.” Failed cement job. Not caused by frac’ing. Not an example of frac fluid polluting groundwater. Casings at a production well near Killdeer, North Dakota, ruptured in 2010 following a pressure spike during hydraulic fracturing, allowing fluids to escape to the surface. Brine and tert-butyl alcohol were detected in two nearby monitoring wells. Following an analysis of potential sources, the only source consistent with the conditions observed in the two impacted water wells was the well that ruptured during hydraulic fracturing. There is also evidence that out-of-zone fracturing occurred at the well (Sections 6.2.2.1 and 6.3.2.2). “Casings at a production well near Killdeer, North Dakota, ruptured… allowing fluids to escape to the surface. Brine and tert-butyl alcohol were detected in two nearby monitoring wells.” Casing failure. Not caused by frac’ing. Not an example of frac fluid polluting groundwater. There are other cases where contamination of or changes to the quality of drinking water resources near hydraulic fracturing operations were identified. Hydraulic fracturing remains a potential contributing cause in these cases. There are other cases in which production wells associated with hydraulic fracturing are alleged to have caused contamination of drinking water resources. Data limitations in most of those cases (including the unavailability of information in litigation settlements resulting in sealed documents) make it difficult to assess whether or not hydraulic fracturing was a cause of the contamination. 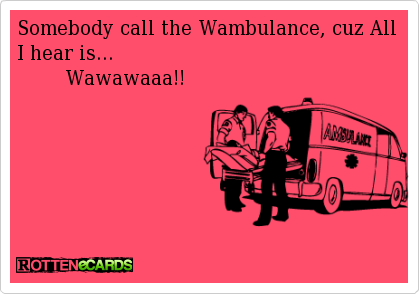 Wawaaaaaaaaaaa!!! They won’t give us the evidence!!! Generally, less is known about the occurrence of (or potential for) impacts of injection-related pathways in the subsurface than for other components of the hydraulic fracturing water cycle, which tend to be easier to observe and measure. Furthermore, while there is a large amount of information available on production wells in general, there is little information that is both specific to hydraulic fracturing operations and readily accessible across the states to form a national picture. Good frac’ing grief!!! Since they don’t know much about how the actual frac’ing operation could impact groundwater, they just expand frac’ing to include “hydraulic fracturing water cycle” in their definition of frac’ing. December 14, 2016 in EPA, Fracking. How do you get a fracking water cycle that is miles below and disconnected from any real water cycle? Theoretically writing, one can envision a case where the fracturing operation was carried such that the casing strings were exposed to high pressure pulses, which in turn burst the well. I wrote “the well” because it’s common practice to have two well cemented casing strings through the fresh water zones. This means the pressure pulse has to breach both (this is actually possible, although it’s difficult to achieve in real life). I think we do have to agree that any sort of industrial operation which involves a lot of steel, high pressures, and a lot of water, can, in some circumstances, lead to an undesired outcomes. I was trained to call these incidents and not accidents, because in general practice one has to be quite stupid and irresponsible to line up all the errors required to beat the odds and get somebody killed or cause a pollution incident. I didn’t read the full report, but my professional opinion (and it’s very professional) is that the EPA report is ok until it starts introducing the key sentences needed by politicians to do partisan work. As far as I’m concerned Mr Burke is simply doing what he thinks is required to finish his gig at the EPA with a flourish. I’m not sure about his background, but I wouldn’t recommend him for a job. I was trained to call these incidents and not accidents, because in general practice one has to be quite stupid and irresponsible to line up all the errors required to beat the odds and get somebody killed or cause a pollution incident. Although very smart and responsible professionals can and do “line up all the errors required to beat the odds and get somebody killed or cause a pollution incident.” Complacency and a sense of impunity can infect the smartest, most responsible people. When a dangerous job becomes routine, the threat of “incidents” actually increases. This was the underlying cause of the Macondo, Apollo 1 (AS 204) and Challenger (STS-51-L) incidents. In the nuclear industry, we had to confront the possibility of stacked events after Fukushima. At least, confront them in a more direct manner. As unlikely as those scenarios are, they do occur sometimes. Still, designing safety systems to handle a series of unintentional, random, or natural catastrophic events is quite different from hardening a design against deliberate stupidity or sabotage. Quite different! So correct on that whole assessment. Aside from this, they have quickly pushed through ICR (information collection request) on random onshore operators (700,000 wells) and all the natural gas infrastructure up to the gas service. The whole thing is another classic inept move from the Obama EPA that is going to do nothing but cost industry money. They estimated iirc $80 million cost in total, but I estimated $280 million in cost to the operators alone, and their estimate on the gatherers was about twice as large as their estimate to operators. Agreed. My professional opinion (and it is professional) is the same as Fernando’s. 1) Fracking is an inherently dangerous activity, and thereof must be highly regulated or even banned. 2) Fracking results in occasional incidents, which should be monitored and prevented. 3) Fracking is extremely safe, and only rarely, under very unusual circumstances, could something bad happen. Frack on! Only one of these conclusion is worth 6 years and millions spent. Conclusion 1. It is the only question that should be answered in this type of study. Is fracking MORE dangerous to aquifers than not fracking? Of course it is. Just like driving is more dangerous than sitting on the couch. So? I could have told you that for a cup of coffee, not six years and millions spent. In fact conclusions 2 and 3 are obviously true. No study necessary. The only possible reason for this study to exist is to prove/disprove Conclusion 1. And the study definitively shows that Conclusion 1 is not correct. There is no debate on this point, and the draft report clearly stated this fact. Mission accomplished. The problem is that someone edited the report to pretend that conclusion 3, or maybe 2, is the same thing as conclusion 1. It isn’t. They are not remotely the same thing. In fact they were never really in question. could a fracking accident result in problems. Uh, yeah. So? I’ve had dozens of meetings with companies where we sat down and tried to minimize our waste and chemical usage. We don’t do it because anyone loves the environment. we do it because chemicals cost money. Handling chemicals is dangerous, and could hurt someone. Anytime people find a food grade, or biodegradable substitute for a hazardous chemical they get awards. An OSHA reportable incident can cost millions in lost time, wages, medical bills, insurance costs, etc. Plus telling the family of your co-worker he got killed, or lost a leg. Spills cost money – millions. They can shut down a project, end your career. No one wants to handle more water than they absolutely need to – again, water is heavy, handling water costs money. No one wants to pump, or dispose of, a gallon more than absolutely necessary. So all the incentives, not just regulatory, but monetarily, culturally, morally, socially, are in favor of not causing impacts to aquifers. @ Tenn. You can say the same thing about medical malpractice. Or any profession really. Most busineesses and professions do not intentionally F-up. But it happens. Usually rarely. But it happens. Was the study designed to prove that mistakes happen? or don’t happen? Or could happen? You don’t need a big study to prove something bad might happen. I don’t need a study to prove that doctors might occasionally, accidentally, prescribe the wrong drug. Such a conclusion is obvious. Everyone works very hard to prevent that, and mistakes are investigated to reduce the odds even further. But I certainly would not ban drug prescriptions based on the small chance of an error. The problem with the report is the wording was changed to make the chance of an accident occurring sometime somewhere into a reason such an activity should never be allowed. Such a case might be made if the upper limit of the potential adverse impact was such was too high, or the benefit too small. Neither is the case here. Unfortunately this has become an all too common corruption of science – assigning infinite damages to very small risks. Where is the section on disregarding other direct and definitive isotopic tracer tests conducted by Federal agencies on the issue and already paid for by taxpayers? Is that section near the one about implementing the “out of abundance of caution despite the findings” methodology of NY. I have theory as to why NY has imposed the moratorium on fracking in NY. This is my personal idea (though others may have come up with it independently) and has not been vetted or verified, but I think I’m right. New York is run by a liberal/progressive crime syndicate, with its biggest support base in the gutters of New York City and other big metropolitan areas. most of central (or upstate) New York is much more rural and conservative. My theory is that they imposed the moratorium to prevent the sudden appearance of a bunch of rural, conservative millionaire landowners and leaseholders that suddenly had the money to confront and take on the powers that be. They ain’t never taking on Wall Street who calls the shots in NYC. Well it is Obama’s EPA science. It is consistent with his administration’s very clear willingness to deceive the public when it aided a political purpose. Does anyone think a NYT or WaPo reporter is going to be allowed to report on how flimsy this EPA fracking report is? They have got their goose-stepping marching orders from the Obama WH and ThinkProgress to de-legitimize Donald Trump. Nothing else matters to the US Marxist Media at this point. When they discuss fracking problems they never use has caused, have caused or will cause (etc) they only use may, might, can and could (etc)…I wonder why? Yep. 99.99% of them multiple times without incident. Used to be called “torpedoing” a well, back in the oil boom/wildcatter days. Putting an explosive charge down the hole and setting it off. In Kennerdell PA there is a small monument to a group of men killed in an explosion. They were transporting nitroglycerin to be used in oil wells. There is not much scientific information about fracking effects. Even the bit that we do have is utterly lacking in unequivocal evidence regarding the deleterious effect of fracking fluids. The mention in the OP of the detection of brine and tetrabutyl alcohol potentially associated with a failure event is not clearly causal. And, tetrabutyl alcohol occurs in beer and garbanzo beans. It’s organic and biodegradable – just like methane, and might be the result of deep dwelling bacteria metabolizing methane. Its almost like someone is aware of the risks and designs the wells to mitigate those risks. It has been this way since Obama shoved his EPA into this. They have rolled the entire operational cycle into the incorrectly spelled term frac[k]ing because there has been NO (ZERO) instance of fracing actually causing an impact to potable groundwater. NONE! Two million hydraulic fracture treatments, in over one million wells, in 27 O&G states, over a period of 65 years – and NOT ONE INSTANCE. Check page 54, on “Natural Hydrocarbons in Muds.” Cataloged date is wrong, actually 1962, language from the past, possibly difficult to read now. Other sections on pollution, including bleedwater. No schist, that would be found below kerogenic shale ;*). BTW, the term is frac’ing a contraction of fracturing. The process is highly controlled with both upper and lower packing to isolate zone of work. Pressure and volume are highly controlled and any annulus defect is detectable by pressure and or volume migration past packers. I have learned to live with the fact I am a series of complex chemical reactions. Dihydrogen monoxide is only fatal if inhaled in its liquid phase. It also acts as a very good form of truth serum when Inhaled in its liquid phase. Pretty nasty if high temperature hydrogen hydroxide vapor is inhaled or even comes into contact with the skin. Possibly fatal. Don’t forget the hydroxylic acid! Natch. But calling it that makes it sound a bit fruity, a bit not-really-real-acid. I prefer the shorter ‘hydroxic acid’. You can easily imagine sitting on the lab shelf in a stoppered glass bottle fuming away to itself, waiting for an innocent alkali to wander by. Oh, and it rhymes nicely with ‘toxic’, too. They don’t call it the “universal solvent” for nothing !! The conventional spelling has become “fracking.” So, that’s what I now use. I had to learn it in 6 weeks or I would have been fired. What really complicated matters was getting the morning wires from a bilingual rig overseas. Some of the reports were prepared in both languages and jumped back and forth. And then there was this guy who only sent: “rigged up, fixed well, rigged down, moved to next well”. In the industry, which invented the term, we use fracing or frac’ing. Since we invented it…. Actually, the highest volumetric chemicals injected are di-hydrogen oxide and silicon dioxide. Is it fracking or fracing? Hydraulic fracturing has become a hotbed of controversy, but so has its nickname — fracking. The origin of the “fracking” moniker is far more innocuous than its current use in certain circles, as a kind of expletive. Battlestar Galactica used “fracking” as a surrogate for the more popular F-word. “Fracing.” One C. No K.
A few folks, seeking to clarify the pronunciation, used “fraccing.” Two Cs. No K.
Barnett Shale-based blogger and activist Sharon Wilson recently set out to track down the founder of “fracking.” Wilson eventually fingered Lisa Sumi as the originator of the K-based spelling. In 2004, Sumi joined Earthworks’ Oil and Gas Accountability Project. She took on a research report about the then-relatively unrenowned method for extracting oil and natural gas. Sumi said it took her two years to convince the folks at Earthworks to add a K to their spelling of the term. She had no idea the K would become a political powder keg. As public awareness of hydrofracturing has gained popularity, so has that alternate spelling and the political rancor around the K.
Stalwarts cling to tradition, saying “fracking” sounds too much like a curse word and has been made into the rallying cry of environmentalist opponents. But many in the oil and gas industry have accepted linguistic authority and switched spellings. Meanwhile, the public has developed a clear preference. A Google search for “fracking” turns up more than 8 million results, even more than “hydraulic fracturing,” which turns up 2.2 million. Fracing was always spelled “fracing” up until Josh Fox produced his pack of lies. Fox did so little research, including having knowledgeable people “peer” review his work, that he misspelled the word used to describe the process. That should give everyone an idea of how poorly researched Josh Fox’s movie was. It can be argued that language is the most important foundation of civilization. As Orwell knew controlling language, controls the society. I thought the standard euphemism for that word was “frigging”? But ‘fracturing’ has the ‘c’ with the standard ‘k’ sound before a ‘t’ – think “manufacturing”, “faction”, “diffraction”, etc. So if you are going to shorten ‘fracturing’ you must either replace the ‘c’ by a ‘k’ so as to retain the ‘k’ sound (fraking – but here the ‘a’ would become a long ‘a’, as in ‘baking’, so not acceptable) or just add the ‘k’. ‘Fracing’ would be normally pronounced in English as ‘fra-sing (again a problem with the long ‘a’, think ‘phrasing’). Remember ‘c’ before a ‘i’ or an ‘e’ is normally pronounced ‘s’, while ‘c’ before ‘a’, ‘o’ or ‘u’ has the hard ‘k’ pronunciation. Before someone takes me up about the English ‘Caesar’, remember that this is one of those words derived from latin, where the original vowel was the diphthong ‘ae’, which became recognised as an ‘e’ in English (think also English ‘oe’ as in “Foetus” = American “Fetus”). How was the word “fracing” originally pronounced. Did it rhyme with “tracking” or “lacking”? If so, then this explains why many scientists have trouble communicating with the public on even the most basic level. Standard English pronunciation of any “-acing” would give it a soft “c” same as “s”, not a hard “c” like a “k”. “Fracing” only works as a spelling if it rhymes with “facing” or “tracing”, in which case people should be corrected on their pronunciation. but then I look further into Peter Kearl, co-founder and CTO of Qmast and it’s crickets so ??? I propose resolving the issue by calling it “fracting.” That way, it won’t hit you in the frace. The only reason Obama didn’t order the EPA to manufacture some excuse to ban fracking was the low oil prices it produced were the closest thing to real sanctions against Russia he had available. If he thought he had the Executive authority, without a Federal Court judge’s injunction coming in, thus stopping him, he would have had the EPA issue an endangerment finding on fracking and then rule on a ban. Until 4 weeks ago, they thought they had another 4 years to continue their War on Carbon Fuels. The climate hustle is 5 weeks and 2 days from ending. Yep. The oil price crash has trimmed about 4% off Russia’s GDP. The sanctions have been worth 1-1.5%. Also, the low oil prices, as contrasted with “skyrocketing electric prices” and “bankrupting coal companies”, provided the only positive thing BO could point to in eight years of his economy. I will predict here and now that Scott Pruitt will not be confirmed by the Senate. A few soft Republicans who mouth climate change platitudes, or are frightened by EPA’s claims about groundwater, or find the “fox in the henhouse” meme too distasteful, will knuckle under. Olympia Snowe comes to mind. so salt water and stuff that freezes in the mid 70’s F ? Another is Marco Rubio: two is enough to scuddle the nomination. You really think all of the red-state Dems will bow to Schumer? Not likely! How many red state Dems are on the Judiciary Committee? And how many come up for reelection in 2018? I honestly don’t know the answers, but it only takes one Republican defector on the committee to stall the confirmation, and two to reject outright. In ’61-62 I was a geohydrologist (hydrogeologist for some) evaluating all aspects of groundwater along and near the rightaway for the Greater Winnipeg Floodway, at the time the 2nd largest excavation project surpassed only by the Panama Canal. Anticipating likely claims of damage to waterwells in the rural area, it was decided to evaluate private wells, their depths, levels, water quality and state of repair as part of the work and to put in some extra strategically located observation wells. We provided a free service advising on upgrades to wells in poor repair. Sure enough, complaints did come in, but the records were able to show that not one was compromised by the Floodway. I would have thought this precaution would be exercised as a matter of course elsewhere, however, apparently not. It would be a kindness if adopted to call it the Pearse Strategy! I also wrote a published report “Proppants: North American Industry Markets and Outlook” (2015) (about the frack sand-natural and ceramic) for Roskill Information Services in UK. It’s pricey, intended for industry, so lm not looking to promote to readers. Evaluation and analysis of all offsetting wells is done routinely in Canada and in Alberta as a requirement prior to fracturing operations. Precautions are proactively taken to minimize risks to people and the environment including ground water protection. It’s been this way long before the environs got involved. “Canada and Alberta”? As in distinct? Yes, a truism of life is that every action MIGHT have an adverse consequence. What a stunning revelation! It is certainly time to drain the EPA swamp. But the vermin eliminated will be howling like crazy! LOL! David, your reference to the Killdeer, ND incident intrigued me so I looked at the reports. You say the casing failed but this was NOT caused by fracking. However the reports clearly say that the production, surface and conductor casing failures occurred during the Sept 2010 frac at the Franchuk 44-20 well when pressure spiked to 8390 psi. All the failures were at groundwater aquifer depths. Why do you claim otherwise? The failure occurred at the production level (i.e. near the surface). The problem was not related to the fracturing of the oil formation, but either an equipment malfunction that caused the pressure spike or the casing that didn’t hold up to its rated capability. Yep. The failure didn’t occur at the fracking depth. It occurred way uphole. Which means improper packer set. Now we open Pandora’s Box in that this happens everywhere. :! Incidents happen, just like wind turbines killing endangered raptors. During a hydraulic fracturing phase – a process using intense pressure and fluids to break through rock to reach oil – a mechanical failure caused a breach in the oil well’s casing. The pressure blew through two steel pipes surrounded by cement and oil, gas and liquids began erupting from the well head. Because it was a casing failure. The casing you put into the hole has to withstand the pressures, both natural and induced. During hydraulic fracturing operations in September of 2010 near Killdeer, in Dunn County, North Dakota, the production, surface, and conductor casing of the Franchuk 44-20 SWH well ruptured, causing fluids to spill to the surface (Jacob, 2011). The rupture occurred during the 5th of 23 planned stages of hydraulic fracturing when the pressure spiked to over 8,390 psi (58 MPa). Ruptures were found in two locations along the production casing―one just below the surface and one at about 55 ft (17 m) below ground surface. The surface casing ruptured in three places down to a depth of 188 ft (57 m), and the conductor casing ruptured in one place. Despite a shutdown of the pumps, the pressure was still sufficient to cause fluid to travel through the ruptured casings and to flow to the surface. Ultimately, over 166,000 gal (628,000 L) of fluids and approximately 2,860 tons (2,595 metric tons) of contaminated soil were removed from the site (Jacob, 2011). Spills of produced water have occurred as a result of well blowouts. Fingerprinting of water from two monitoring wells in Killdeer, ND, was used to determine that brine contamination in the two wells resulted from a well blowout during a hydraulic fracturing operation. See the discussion in Section 6.2.2.1 for more information. In another case, casings at an oil well near Killdeer, North Dakota, ruptured in 2010 following a pressure spike during hydraulic fracturing, allowing fluids to escape to the surface. Based on the data in this study, the TBA observed in NDGW07 and NDGW08 was consistent with the blowout of the Franchuk well being the source of the TBA. I question the EPA’s assessment of the casing failure in ND. During a frac, there are numerous pressure relief valves at surface to protect the casing and/or tubing. If the production casing were breached, the weak point would be at the shoe of the surface casing; well below the level of the groundwater aquifers. This would suggest a failure of the relief valves, wellhead and/or surface piping used in the frac process; putting some frac water of the drill pad. And somehow this water made it to the monitor well. The EPA, in it’s never ending effort to discredit fracing, probably used it’s most sensitive equipment to find traces of a chemical that would have been in the ppb range. The concentration is not significant, only the detection. This is the bias that is embedded in the EPA. I think a better question for the EPA is whether the identification of a of a chemical in a barely detectable range is equal to the death of one bald eagle by a wind turbine? The EPA needs to be challenged on what “equivalency” it uses to justify it’s decisions to penalize the fossil industry and reward the renewable industry. Does the report provide distance from production well to the two impacted water wells? How significant was the groundwater aquifer impacted from incident? If only two wells were reportedly impacted, were there mitigation procedures conducted, and if so, how successful? Water wells are impacted annually from all sorts of activities, from agricultural processes, leaky septic fields, to nearby roadway spills and activities (think routine heavy “salting” activities during winter snow/ice clearing). We have TWO wells “possibly” impacted from this fracturing activity, that’s it…. Nope, not until Trump won. David – Yes, Killdeer was a blowout but it happened during the frac. That well would not have experienced a blowout during normal operation because its maximum shut-in pressure was very likely far below 8390 psi, given its depth. The frac caused the blowout. This is what critics will home in on. Those outside our industry can not or will not make the distinction you are trying to make. Also, why do you question the EPA assertion from page 9-23 that the TBA is very likely from the frac fluid at this well? Their reasoning seems pretty tight to me. I realize the EPA has only managed to scrape up a few isolated incidents but that’s all the critics need. As industry professionals, we must address valid criticism head on. The shut-in pressure is always lower than hydraulic fracturing pressures. The blowout was due to an up-hole casing failure, not the frac job. The traces of TBA may very well have been the result of the blowout. The TBA was only found in two monitoring wells near the site of the blowout. Fracking did not pollute the groundwater. “Could” is the frustrating quibble which opponents of fracking will drive their idiot truck through. Of course we know all to well the analysis paralysis that reports like this are meant to create. Think of the moon junk we left from the space program or the many criminal uses of the internet. Your good grief lament is apt. So, two documented cases, neither of which were the fracturing process, but were part of the legacy well process. One had a happy ending (residence that had previously had to rely on wells now got proper water hookups) and the other only affected monitoring wells (i.e. not effecting residence). So the conclusion should be that current processes are adequately monitoring for faults. And… Frack fluids didn’t pollute groundwater in either incident. Yes I too was surprised to see such a broad conclusion reached on the basis of only 2 examples. And as you explained the examples are not even relevant to fracking as practiced today. For me this report further cements the conclusion that the EPA is primarily a political organization. And neither case resulted in the pollution of drinking water with frack fluids. In defense of the masses, most people do not realize that the water with the oil is not the water they drink. Geologists do a disservice to their industry by not explaining (patiently) that the water that occurs with the oil at 18,000 ft is an undrinkable brine. A second disservice by geologists is the non-discussion of surface showings of oil & gas, which are common and have been reported many years before fracking was ever attempted. If oil & gas has been naturally making its way to surface for thousands of years the chance of it entering drinking water is 100%. So I blame the geologists. They drink so much beer that they are unable to explain to the hobbled masses that the water contaminated by fracking is not drinking water and the drinking water contaminated with oil & gas can occur (and does) occur naturally. I say more beer for the geophysicists and less beer for the geologists. It is foolish to think that oil & gas drilling does not affect drinking water. It certainly does. But fracking does not affect drinking water. This is the problem with politics. Those who want to stop fracking use the bad results of poor cementing as proof. This lets the poor cementing problem off the hook. Something not mentioned when reporting the two instances of failures that appear to have been frack related, there are some 1.7million currently active o&g wells in the US and even conventional wells have been fractured since the beginning of the industry. The idea was the invention of a US Civil War veteran in the 1860s using gun powder to stimulate…. water wells of all things! Further development led to use of nitro glycerine and a number of workers were killed in the early days. This was followed up by ‘torpedoing’ of wells right up to the late 1960s at least. The first frack was done on a gas well in the Hugoton gas field in Kansas in1947. Development continued until fair results began to be achieved in the Barnet Shale in Texas in 1982. It was only after the advent of horizontal drilling did hydraulic fracturing become big time and most hydraulic frac jobs were done after 2002. So, somehow, it took 150yrs. of formation fracturing before it got noticed! The hype and angst was developed only when the anti democratic, new world order totalitarian elites mobilized their useful fools when it was clear that peak oil and gas hadn’t occurred and they weren’t done with fossil fuels after all. Masters of fake news, they generated all the ills of the technology. They had already been enlisting peak oil as a reason for promoting Luddite tech to replace them. Land surface has been washed by rainfall for hundreds of millions of years. Living things have adapted to the “chemicals” that are normally found in surface runoff and in the water that drains into shallow aquifers. Anytime we extraction fossil fuels or metal ores from the ground, we bring material to the surface to which we may not be adapted – most notoriously mine tailings. One of the best things about fracking is that relatively little waste material is brought to the surface. However, the water in fracked wells is a concern – probably not from the “toxicity” of additives in fracking fluids, but the organic chemicals that leech from the fracked rock. One vulnerable spot is the casing where wells pass through drinking water aquifers. Unfortunately, we have been drilling wells through aquifers for about a century in hydrocarbon rich regions (the Pavilion area has many old wells) without always being careful at this point of vulnerability. I’m more worried about the threat past drilling operations (and resulting surface contamination and improper waste disposal) pose to drinking water than modern fracked wells. A fracking operation causes nearby wells to be tested and problems discovered – and most likely those are existing problems. It seems absurd for contamination to travel a significant distance underground to a nearby well within a few months of fracking. Traveling from an old well over a few decades makes far more sense. The fracking industry should be testing all nearby wells before beginning operations, because their owners will be testing afterwards. Perhaps this is routine now, but it wasn’t in Pavilion. Aquifers are an critical resource that produce value for local residents “forever”. Extraction of fossil fuels produces benefits (mostly to outsiders) for a short period of time. Following a frac, the first action is to flow the well back; retrieving much of the fluid used in the frac. In the case of a gas well, once the well cleans up enough to meet pipeline requirements (reduced water, sand and possibly CO2) it is switched to sales.. The gas production companies are not allowed to sell gas until the gas meets pipeline quality standards and the production companies required to flare the produced gas until it does meet these strict standards. The environmentalists are always complaining about the amount of gas flared by production companies but it is the pipeline company standards that must be met before putting a well to sales. These standards are in place to ensure the safety of the pipeline from corrosion and scale. Production companies want to minimize their flaring and put the well on production ASAP to start generating income but pipeline safety comes first. Frank, to your point. From the time the frac is flowed back until the well is plugged and abandoned, the bottom hole pressure is reduced and no fluid moves away from the well, only to the well. Only in cases such as a conversion to a water injection well for reasons of secondary recovery will the bottom hole pressure be increased. The only place frac fluids can be recovered is from the well that is fraced. As for Pavilion Wyoming, in subsequent testing no contamination could be found. The Federal EPA finally gave up trying to find contamination and passed the testing to the Wyoming state EPA. I don’t believe any new issues have popped up in Pavillion for some time and that production continues. Sorry, but I call B.S. You do the classic environmentalist trick of pretending chemicals (gas, oil saltwater, fracking fluids) are “infinitely” hazardous, or in “infinite” supply. Even the most screwed up oil and gas well can only impact a limited area due to hydrology and dilution factors. Yes, I suppose, you can find or invent a scenario where it could, or has happened. Don’t waste your time posting it – the 99th percentile situation is not actually all that relevant to the discussion. Aquifers will be theoretically used “forever”. However, oil, gas, and other potential contaminants cannot contaminate an aquifer “forever”. This is not a point of contention – this is chemistry and physics. Chemicals break down, or dilute, after a finite period of time. So you are projecting out this aura of infinite risk to irreplaceable resources, when there is no such thing. We are discussing finite risks to finite resources, and how best to mitigate those risks. Any one who’d want to drink water from a hydrocarbon formation is an idiot. Why would I want to spend a million or more dollars and and not insure it is going into the formation to produce the most oil and gas. Yes, a key point. It is not in the operators interests to pollute local groundwater, because that would mean they are losing valuable product and money. People who do that will get fired, before the EPA becomes involved. As one living here in the heart of Evil Marcellus Shale country there is no ground water contamination from fracking. The only ground water contamination so far documented by EPA and PADEP is from fuel spills at work sites. And spare me Dimock PA, the water in that region has been known to have high methane content from the very first settlers to establish there. I have taste water filled with gas in a rural area, years ago. The people who lived there (pre-bottled water era) would leave the water settle out to allow the gas to escape. The taste is always there though and the people who lived there adjusted. True story. I made several visits and drank their tea. I’m still here, decades later, FYI. And the microbes in your colon also produce far more methane than you could ever ingest by drinking such water. It’s called flatulence, and several other words. Basis biochemistry which Greenpeace doesn’t like to explain to the people they dupe out of money. I have tasted water that came from underground in London. Very highly contaminated with calcium carbonate. In fact, the rest of Croydon had a different extraction point, and the water was so highly contaminated that the Water Authority had to extract much of the contaminant to make the water saleable. They had a mountain of white stuff which had been removed from the water. The water was put into pressure bottles – glass contained within a stainless steel mesh – and then was injected with high pressure carbon dioxide. This was quite drinkable, in spite of the rubbery taste, which I think came from the rubber seals. However the rubbery taste was, I believe, not noticeable when the water was mixed with ethyl alcohol, and a host of minor carbohydrates and minerals. You will have read about this process in many books of the Victorian era, where people drank it. They called it a “Whisky and Soda”. No known addition of sodium, however. Also known as the EPA’s new report on who to fire in January…. – they’ve already said ‘having no clue’ ! What has been found so far is water contamination by fuel spills on work sites. EPA and PADEP have both had to admit in front of a judge that they have only found fuel spill contamination and no contamination from “hydraulic fracturing” here in PA. Have not seen any proof that fracking has been found to be responsible for water contamination anywhere else, either. Oh, EPA was caught falsifying test data in several cases out west. There is that, I guess.